A dozen post-primary schools needed emergency funding in March just to pay their teachers. That is according to the outgoing chief executive of the Education Authority (EA) Gavin Boyd. Mr Boyd was the EA's first head when it was established in April 2015. He leaves the role this week to be succeeded by Sara Long. The EA is responsible for spending most of Northern Ireland's annual £2bn education budget. As well as funding about 1,100 schools, it is also provides services like school transport, meals, maintenance and support for children with special educational needs. 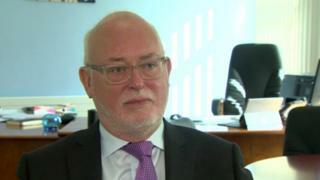 Speaking to BBC News NI before he stepped down, Mr Boyd said that education was in a "financial crisis". "What we're seeing is ongoing teacher redundancies and subject choice is being restricted, particularly in our smaller post-primary schools," he said. "We're seeing, at primary level, increased class sizes. "I'm also seeing in very large schools - some voluntary grammar schools and grant-maintained integrated schools - real pressures. "We're having to step in this year in up to a dozen schools that needed our help so they could pay salaries in the month of March." There are 50 voluntary grammar schools and 15 grant-maintained integrated post-primary schools in Northern Ireland. They have usually had a larger degree of autonomy in managing their own budgets than other types of schools. But Mr Boyd said that, in some of those schools, emergency funding from the EA had been needed to ensure staff wages could be paid. He has been one of the highest-paid public servants in Northern Ireland on a basic salary of around £150,000 a year. However, the EA has come in for regular criticism during his four years in charge, especially from some principals over the level of funding to schools. Mr Boyd also admitted the authority is struggling to support growing numbers of children with special educational needs. "Despite the fact that our real terms funding is reducing in the authority, our expenditure on special educational needs has increased by about 6% per annum," he said. "We're doing our very best in very difficult circumstances but the fact is we're not meeting the additional needs coming forward in a way that parents and school principals and teachers would like us to meet those needs." The EA has not operated under the guidance of an education minister since the assembly collapsed in early 2017. Mr Boyd said one was needed to take decisions to transform the education system. "We've too many schools and it costs money to maintain the number of schools that we have," he said. "We do need political support and political direction to carry through the rationalisation programmes that we all know need to take place and would actually be beneficial for our children and young people." However, he had a stark warning for politicians when they eventually got back in charge. "We need a significant increase in baseline funding for education," he said. "If we continue to reduce real terms funding for education things will get worse."